What an awesome feeling. Those were happy tears, I hope. Really sweet post. Why can’t you wear brown for your author pic? The mixture of emotions you are feeling sounds a little overwhelming at times. You are amazing for writing a book and I can’t wait for it to be published. Consider me your one person evangelist once it’s published; it will likely be everyone’s birthday, Christmas and just because gift. Be proud of yourself, you are accomplishing something that for most of us is just a dream. 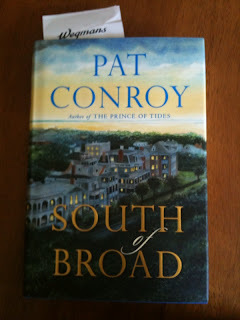 I LOVED Pat Conroy back in the late 80’s early 90’s. I think it’s time to re-read those books. I really miss the South and Conroy writes about the South with the best of them. The movie for Prince of Tides? YUCK. such a sweet feeling–so happy for you. i’m your lame friend who actually cares what you wear in your picture–“cares” as in understands the feeling of needing to care yourself and not being sure what to do with that feeling or how to go about finding the right shirt that makes you feel just like yourself in the picture. good luck! Back to Wegmans … we lived near Syracuse for 5 years and I absolutely loved shopping at Wegmans! Wide aisles, well-lit, helpful clerks. Sigh. Our local market now can’t compete … I mentioned Wegmans on Twitter a few months ago, and now they’re following me, how odd is that? !